Resizes and converts images (photos etc.) for use in web sites, blogs, e-mail newsletters and with programs / applications. This is a freeware edition of SamLogic Image Resizer. 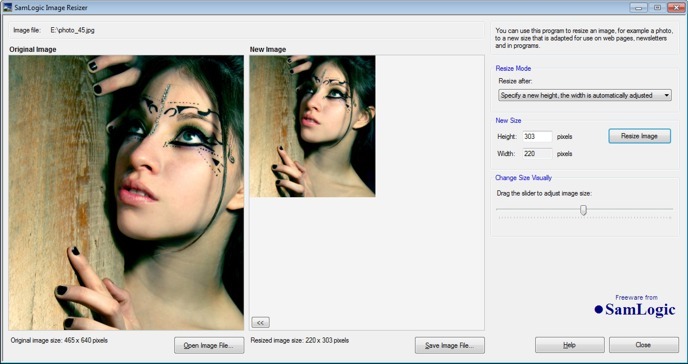 SamLogic Image Resizer is an easy-to-use program that can be used to resize and convert images (photos etc.) so they can be used in web sites, blogs, e-mail newsletters, and with programs / applications. SamLogic Image Resizer makes images smaller in size, optimizes the images resolution (DPI) for best quality on screens and can also convert CMYK color images to RGB color images. By reducing the size of images they will load much faster if they are used in web sites and blogs. And if you have an e-mail newsletter that you send out, your contacts will download the newsletter much faster if the size of the pictures are not so large. The quality of the images will often also be better if you resize them in a program that are designed for this purpose instead of letting the e-mail client or web browser resize the picture. When you receive a high-resolution photo taken with a digital camera, it often has a resolution of 300 DPI (dots per inch). But a computer's screen (display) usually only shows a resolution of 96 DPI, so the image will have much higher resolution than it's necessary. This makes the images unnecessary large, and by reducing the image resolution to 96 DPI, the file size of the image will be reduced many times. This will not affect the quality of the image in a negative way because the computer's screen can not show the higher resolution. In fact, often the quality is better if the image is optimized for the screen using a conversion tool. Sometimes images are saved using the CMYK color model. This is common if the image will be used in a color printing process. Computer's software and computer's screen uses the RGB color model, and if you uses a CMYK color image in these circumstances, there is sometimes a risk that the image can not be shown. Not all software can recognize CMYK color images. To be sure that the image always will be shown, it should be saved using the RGB color model. SamLogic Image Resizer will automatically save images so they use the RGB color model. SamLogic Image Resizer supports the JPEG, PNG, TIFF and BMP image formats. You can convert between these image formats if you want or keep using the same image format when you save the resized image. SamLogic Image Resizer can be run in Windows XP, Windows Vista, Windows 7/8/10 and Windows Server 2003 or later. Microsoft .NET Framework version 2.0 (or newer) must also be installed. The screen resolution should be at least 1280x768 pixels, the free hard disk space 5 MB and the RAM memory at least 512 MB.